If we know success when we see it, it makes sense that we can learn how to build it – and even more importantly, how to encourage it – early on in our children. While there are literally hundreds of books that talk about techniques for self-motivation and promoting success, we know of none about how to “bounce back” after a setback or how to sustain motivation for the long run. What makes our book unique is that its focus is on how we maintain a feeling of success in the midst of a world, and a life, fraught with disappointments, setbacks, discouragements, and inescapable injuries and insults – experiences that often result in feelings of shame, demoralization, loss of initiative and lowered self-esteem. Dave’s and my collaboration is based on the belief that success is not a straight-line phenomenon, like a rocket lifting off at increasing speed to the moon; rather; it is a process that more resembles the ups and downs of a long-held blue chip stock in the stock market. So, part of the focus of our book is about how to raise children who are shame-resilient – who are not prone to be frequently tripping up, or collapsing, because of faults in the bedrock of their self-esteem. But our book is for adults too. Whether you are an adult or a child, the same principles apply. Our challenge, as humans, is about how to sustain, rekindle, and revitalize feelings of self-esteem and motivation after episodes of failure, injury or disappointment, and this challenge is lifelong. It is about the ability to recover and regain one’s “success attitude” after the inevitable misjudgments, mishaps, missteps, and yes, even tragic catastrophes of real life. 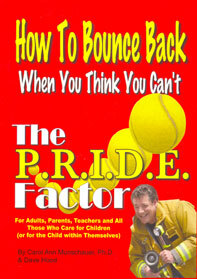 What are the necessary ingredients that go into the ability to bounce back? Dave Hood, in his series of children’s movies, was inspired on the set one day when the mantra, “Shouldn’t have done that!” spontaneously came out of his mouth! This saying came from deep within his personality, without conscious intent – as is true with the creative genius of many artists – and it was this “mantra” that became the inspiration for our book. Put simply, the mantra becomes the focal point around which one has the opportunity to revitalize one’s success when one has done something one “shouldn’t have done.” Or, to extend the meaning of the mantra: to recover when someone has done something to you that he or she “shouldn’t have done.” Extended even further, the opportunity and challenge begins with: How does one move on when one has been deeply affected by something that “life shouldn’t have done”? These questions, and suggested answers, are the focus of our book.